Yogscast and Winterkewl Games have ceased development on their open-world post-Minecraft sandbox game, Yogventures. But according to Yogscast co-founder Lewis Brindley, that’s “actually a good thing”. “Although we’re under no obligation to do anything, instead we’re going to do our best to make this right, and make you really glad you backed the project!”, he said. There will be no refunds for Kickstarter backers. Instead, they’ll receive a Steam Early Access key for a different open-world survival game, from another developer. “As you may have heard, Winterkewl Games have stopped work on Yogventures – but this is actually a good thing,” wrote Brindley in an email to Yogventures’ 13,647 backers. “The project was proving too ambitious and difficult for them to complete with their six-man team. The initial consolation prize is an Early Access key for TUG, a survival game in development at Nerd Kingdom. Yogscast signed a deal to become partners and collaborators on TUG last week. Nerd Kingdom’s Peter Salinas said Yogscast fans should expect “some subtle influence” in the project. 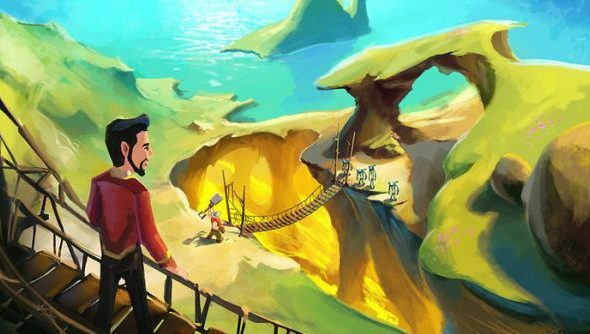 Yogventures developers Winterkewl willprobably go out of business– more than$25,000 oflead developer Kris Vale’s own money couldn’t keep the game on course. What Yogscast aren’t offering to backers are refunds for their pledges, which ranged from $15 to $10,000. Were any of them yours?